Congratulations to my pals, Amos and Louie, on the birth of their baby girl! Amos is one of my oldest friends (oldest as in I’ve known her longer than most friends – she’s not old… we’re the same age because we share the same birth date). Since both Amos and Louie love chocolate and love ice cream – it’s almost a genetic guarantee (I jest, I jest! Biogeeks, please be seated!) that little Alejandra will too. I recently made a batch of teh best homemade chocolate ice cream evar. 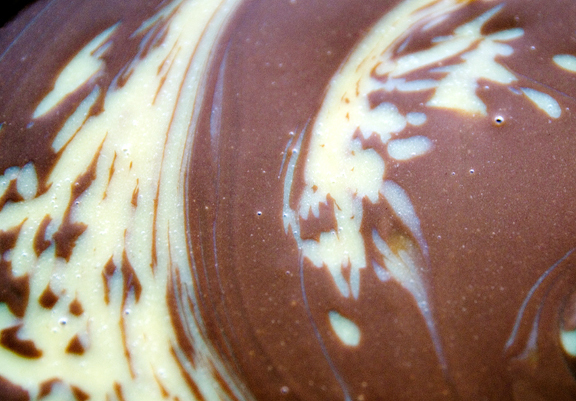 Smooth, creamy, rich, and most of all: chocolaty. What better way to celebrate Alejandra’s arrival than with a post on chocolate ice cream. Now where else would I get this recipe but from David Lebovitz’s The Perfect Scoop? Do you read his blog? I find him to be quite entertaining. His recipes tend to be spot on. I don’t think I can ever go back to non-custard ice cream. And the joy of it all is that I now have a use for all of those egg yolks after making chiffon cakes and swiss meringue buttercream (because that freezing egg yolks trick doesn’t pass muster for pastries). The mixture itself was thicker and richer than some of the other ice cream recipes I’ve tried. That was a good sign. As I scooped it out of the ice cream machine, Jeremy took a taste and gave it a thumbs up. Super creamy texture and not too sweet. The only deviation from the recipe was that I used regular cocoa powder instead of Dutch process cocoa. I read the difference between the two years ago and forgot that Dutch process is smoother – less acidic. There was a slight edge to the ice cream that I’d like to eliminate, and the Dutch process will likely do that. Otherwise, this one is a winner. 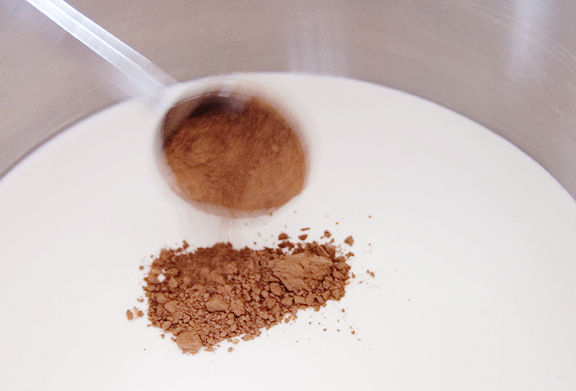 Warm 1 cup of cream with cocoa powder in medium saucepan, whisking to thoroughly blend the cocoa. Bring to boil then reduce heat and gently simmer for 30 seconds, whisking constantly. Remove from heat and stir in chocolate until smooth. Stir in remaining cup of cream. Pour mixture into a large bowl, scraping the saucepan as much as possible. Set mesh strainer atop the bowl. Warm milk, sugar, and salt in the same saucepan. 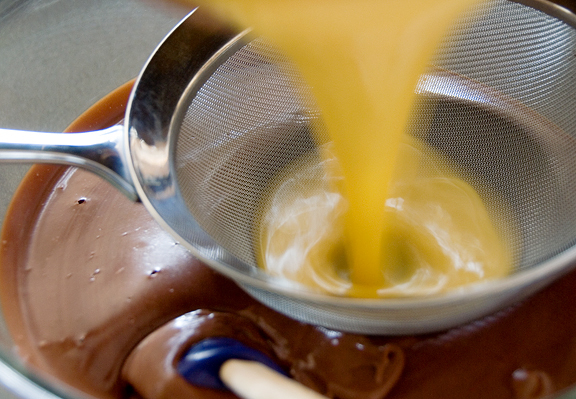 In a separate medium bowl, whisk together the egg yolks. Slowly pour the warm milk into the egg yolks, whisking constantly, then scrape the warmed yolks back into the saucepan. Stir mixture constantly over medium heat making sure to scrape the bottom and corners, until the mixture thickens and reaches nappe consistency. 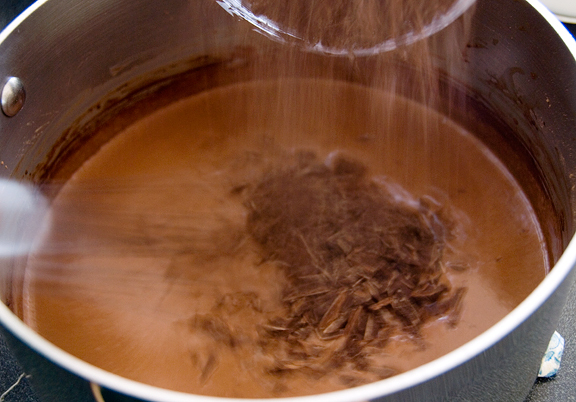 Pour custard through strainer and stir it into the chocolate until smooth, then stir in the vanilla. Continue to stir over ice bath until cool. Refrigerate the mixture to cool thoroughly and then freeze it in your ice cream machine per the manufacturer’s instructions. Yields 1 quart. I haven’t made ice cream in at least a week… it must be time again, this looks fabulous! In other words, amazing-lookin’ ice cream. My goodness – this is just decadent! I made the same recipe from Perfect scoop too…except I tried the Philadelphia version…even that version was super smooth. Brilynn – oh, I’m planning ahead so we’ll have several flavors for our visitors to choose from next weekend! Patricia – I wish I could send you a scoop over the internet. Nabeela – ooooh, you’ll definitely have to try the custard version, I *love* it! This is being used for my halloween party, cause who doesn’t love ice cream! The Perfect Scoop is awesome, isn’t it? I just made his pear-caramel ice cream. Awesome flavor. Michael – yup, I love David! I tried out your chocolate ice cream recipe and its awesome. cafes and here in Germany the weather is just perfect for such great ice cream. Anastasia – that is a *really* good recipe, isn’t it? I think it’s the best chocolate ice cream I’ve ever tried. David Lebovitz is the BEST. Sil – mmm, toasted almonds are great on just about anything. Love DL’s recipes. Seriously yummy. Tweaks: organic cocoa powder, a mixture of unsweetened and semi-sweet chocolate, a little less sugar, an extra egg yolk and spices. Thanks for sharing! 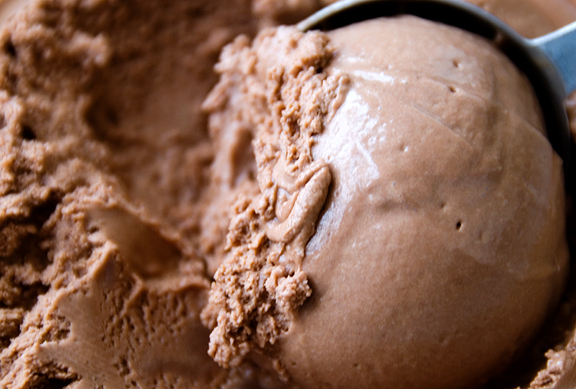 This is the best chocolate ice cream recipe EVER. Thanks so much for posting with photos. I tried it a second time adding just a couple tablespoons of Bailey’s and… oh no, I think I have to make it again… Totally craving more!